How do termites influence savanna biodiversity? Along with collaborators Alison Brody (University of Vermont) and Dan Doak (UC Santa Cruz), we are examining the influence of termite-generated landscape mosaics on savanna biodiversity in East Africa. Our preliminary data indicate that mound building activity by the termite Odontotermes sp. strongly influences soil physio-chemistry, which in turn dramatically alters both plant and animal communities (and their interactions) associated with these mounds. Through this project, we seek to clarify three questions: (1) what is the extent and magnitude of the impact of termite-generated “hotspots” on the savanna community?, (2) what are the mechanisms through which these hotspots are maintained?, and (3) how do anthropogenic disturbances (e.g. 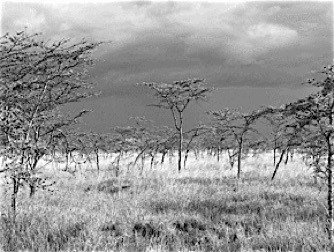 overgrazing) indirectly influence savanna communities through their impact on the termite fauna?